Well, not really. But I will say that two and a half years ago I wrote this post about how to clean up dog vomit and it still gets a lot of hits on Google. We were having a really good streak in which our border collie, Scooter, hadn't barfed in the house since I wrote that post. But hunting season started a few weeks ago, and Scooter gets really neurotic during hunting season. Happily, I was away at a craft fair when I got the text, "Just sprayed off the living room rug in the driveway. Scooter laid out a HUGE barf." Boy was I glad I was gone for that one. Let me show you Paul's ingenious method for cleaning the rug though. He used one of our chicken tractors that is not in use to put the rug on. Then he was able to clean it really well using cleaning supplies and the hose on full force, and it dried in the sun. Paul isn't always the world's best cleaner, but I have to say I approved of his methods for tackling the dog puking episode. Great job! Readers, I'm hoping you haven't had to clean up anything gross lately! I can sympathize with Scooter. With hunting starting Sat you can't go outside without hearing the gunfire. Not safe in the woods. Oh, it is so annoying when they puke on the rug instead of the floor. Ugh. I couldn't figure who the tractor held up the rug then I see what he made it out of. Neat idea and very strong yet lite. Our dog arrived to make my daughter happy so she gets vomit duty. Brilliant! What a great rug cleaning location! Good for you for not being home when that happened. Was I your mentor for this cleaning process??? I have 3 little barfers.... I usually step in it before I clean it though. Have a great day! Poor Scooter if he is anything like our dog it takes quite a bit of upsetting for him to barf big, impressive cleaning tool, bravo Paul. Think I am feeding the katz too much, had it all over this morning. i need to get out the resolve and scrub brush and get muddy paw stains out of my living room rug right now. I have cleaned up more cat vomit than most people would believe. We have found some really good cleaners that do the job without fading rugs or spotting wood floors. And we stay stocked in paper towels. Sometimes that is what I have to do when my daughters dogs come to my house.. take the rug out lay it over the truck and spray it and use a mix of peroxide and dawn dish soap.. Seems to get it out of the rug...Why do dogs or cats have to puke...why can't they do it on the kitchen floor where there is tile? Thank you Paul for taking care of this for your family.. My husband would just look at it and tell me it needs taken care of.. yikes~! The title of this post totally made me crack up. Looks like Paul did a good job on the rug! 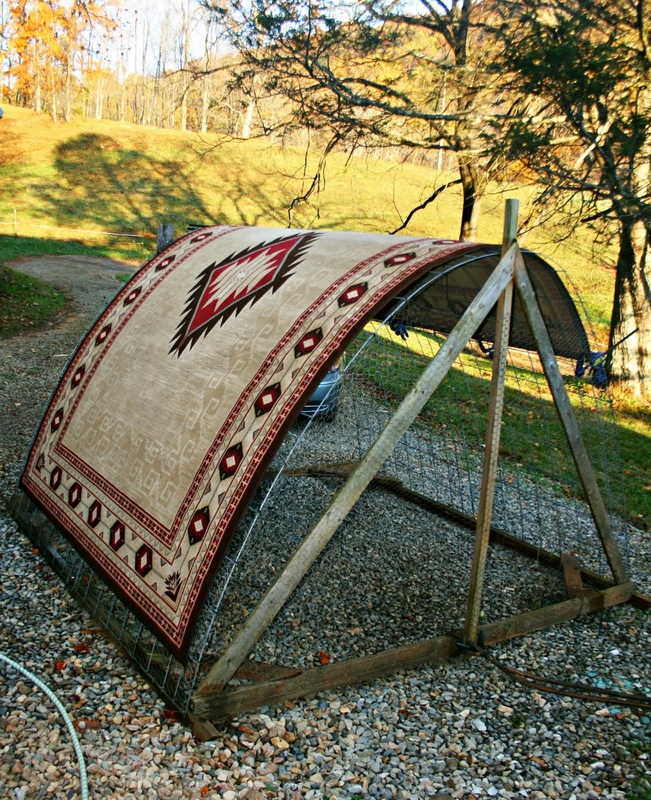 Nice idea for using the chicken tractor to help clean the rug off. I sometimes have to deal with cat puke which is definitely not pleasant! Border Collies??? My favorite. They are sensitive creatures, though. The messiest clean up I had was when Mica threw up on the side of his bed. Well he has a captains bed. Most of the throw up landed in 2 drawers. YUCK! Everything had to be taken out to clean. Some school papers had to get thrown. I consider myself lucky to not get sick myself after cleaning that up! Sometimes puke is worse than the other P word! Ugh. I remember that post. Blech. Cleaning up dog puke is definitely hard for me to "stomach." I do like his method of cleaning the rug! Smart thinking! Our boxer was notorious for doing the 'Walking Puke' when she got old. Puke a little. Step. Puke a little. Step. Step. Puke a little. Step...... Ugh! Thats the best way I have ever seen to clean up dog puke. Yuck! no hunting around here, thank goodness! Maybe this blog will be a hit across the internet also. Funny what people look at!!!!! Nothing too bad. Just the odd ferret poop. Well you gotta admit..... When they do a job ..... They really DO a job!!!!! Love it!!!! No, not lately, but 2 years ago when we got Pickles, due to an unfortunate incident before we took him he got overfed, then had to endure a trip by boat, then car.. he (not it.. hehe) was like a balloon ready to pop.. and he did pop! The result, we had to buy 3 new carpets! Luckily no big financial damage, we never buy super expensive carpets, cheap even, as long as they look decent, in case we get bored and want to change them. I am glad to hear your husband was there to clean it up. That is one great method to cleaning a carpet. Over the summer my grandchildren spilled lotion on our living room rug. I took it out and hung it over the swing set and hosed it off. Then got a broom and bucket of soapy water and scrubbed it down rinsed and let sun dry. It turned out great. He is pretty darn smart! We don't have much carpet anymore….but if someone wants to puke, they seem to find it!